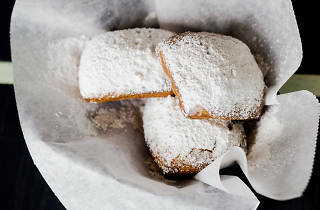 Photograph: Courtesy Analogue Analogue's brunch includes these outstanding beignets. Analogue made our list of the best new restaurants and bars of 2014, and here’s another reason to love the low-key Logan Square bar—it is serving up a terrific brunch on Sundays from 11am–3pm. Chef Alfredo Nogueira’s Cajun-inflected cuisine translates into brunch dishes like shrimp and grits with head-on shrimp, okra coins and tomatoes piled atop a sunny-side-up egg and creamy grits, or the ham hock hash, a hangover buster with two sunny-side-up eggs, shredded potatoes, thick and salty chunks of ham, slices of Kraft American cheese and a drizzle of hot sauce. It’s lowbrow, sure, but exactly the thing I want to eat after I’ve been out on a Saturday night. The stars of Analogue’s dinner menu—the warm, flaky biscuits—are also available at brunch, where they’re listed as a starter alongside beignets and a rotating bread (on my visit, gingerbread). 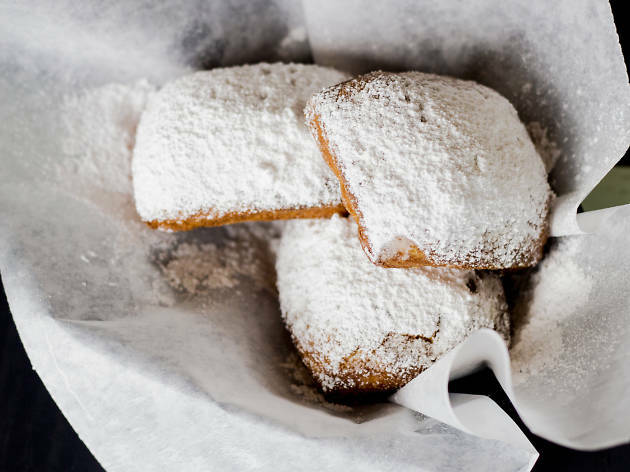 The entrees are small enough that you’ll likely want a starter, and if you can resist the biscuits, order a round of beignets. Only available at brunch, the sugar-coated beignets are light, almost fluffy, and easily the best version of the treat in Chicago. Since Analogue is a cocktail bar, it’s no surprise they have an excellent Bloody Mary, which uses Madison, Wisconsin–made Modest Vodka, Bittercube’s first spirit release. The Bloody Mary has a nice balance between black pepper, Worcestershire sauce and Tabasco, with a bright zip of lemon. On my visit, I walked right in and snagged a table, and the bar never completely filled up. There aren’t many places in Chicago to get a brunch this good, let alone a great brunch with no wait.